The perfect combination of beautiful red rock scenery, two national parks, and small-town hospitality make Moab, Utah an ideal vacation destination. Over one million people every year are welcomed with open arms to this Southeastern Utah town. Whether you’re into music, movies, hiking, biking, rock-climbing, white water rafting, or any one of the myriad of other activities, you will surely find your own reason to fall in love with Moab. 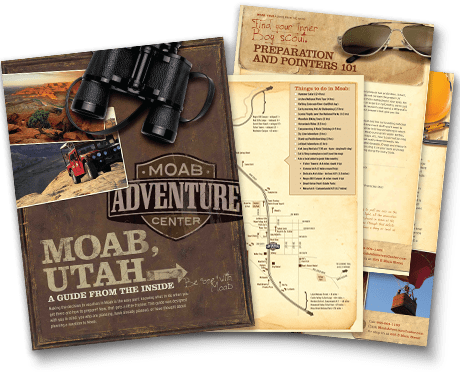 Here are just a few of our favorite events that regularly recur each year that might give you just one more reason to plan another trip to Moab. Moab Art’s Festival takes place every Memorial Day Weekend. Admission to the two-day festival is free. The festival promotes music appreciation, education, and environmental awareness. Enjoy delicious food, beautiful jewelry, hand-made pottery, fine art, games for kids and more. If you’re a biker, check out the Skinny Tire Festival. This four day bike ride takes place every March and transports cyclists through exhilarating red rock canyons, arches and mountains of Moab. So far, the festival has raised over 3.6 million dollars for cancer research. 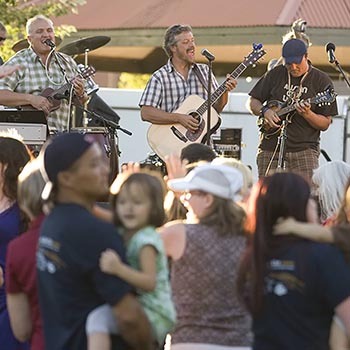 For ten years and counting, the Moab folk festival has attracted thousands of people from across the country. Daytime venues are family friendly and include outdoor performances, arts, crafts, and food vendors. The festival showcases over a dozen different performers, ranging from blue grass to modern acoustic. Enjoy traditional folk performers who tell stories while playing guitar or attend a “late night jam festival”. Canyonland’s half-marathon attracts nearly 4,000 participants each March. The field of runners get the opportunity to run in the shadow of magnificent red rock formations. Proceeds from the event go to charities such as Huntsman Hometown Heroes, Moab Regional Hospital, Humane Society of Moab, and others. The ‘Other Half’ takes place in October. October also hosts the Red Rock Arts Festival, a week-long gathering where artists and art lovers come together to participate in Plein Air, art sales, competitions, and celebrate a shared appreciation for art in our colorful, desert region. If you do hold a fascination and appreciation for art, be sure to participate in a Moab art walk, where local artists and venues offer refreshments and art displays. Happening every second Saturday throughout the season, be sure to visit moabartwalk.com for a walking map to participating artists and galleries. Thousands flock to Moab each year for the annual Jeep Safari—one of the largest four-wheel drive events in the wheeling world. This annual event runs for nine days ending on Easter Sunday. The official event is hosted by the Red Rock 4-Wheelers Inc., one of the local four wheel drive clubs of Moab. Visit rr4w.com for details. Get trashed at Moab’s annual Trashion Show. Create an outfit from recycled materials—also known as garbage—and win a prize for the trashiest costume. Proceeds benefit Canyonlands Community Recycling. Moab 100 Mile & 50K Endurance Running Races every March--Experience the beautiful desert landscape of Moab, Utah while testing your own personal limits. From the immense canyons with 1000 foot walls to the beautiful La Sal Mountains the town of Moab lies in the midst of it all. This is one of the most family friendly ultras around. Visit geminiadventures.com for details. Spend Labor Day at the Moab Music Festival. 13 world-class musicians presented over two weeks. Go to moabmusicfest.org for all the details.